According to NASA, 97% of climate scientists agree the main cause of the current global warming trend is human expansion of the "greenhouse effect" — warming that results when the atmosphere traps heat radiating from Earth toward space. So how does global warming occur? Our earth is surrounded by the atmosphere, which is the thin blue band between the surface and the blackness of space, and is about 60 miles thick. Life on Earth depends on energy coming from the sun. About half the light reaching our atmosphere passes through the air to the surface, where it is absorbed and then radiated upward in the form of infrared heat. About 90% of this heat is then absorbed by the greenhouse gases and radiated back toward the surface. Greenhouse gases include water vapor, carbon dioxide, methane, nitrous oxide, and chlorofluorocarbons. Carbon dioxide and methane are the ones that cause the most concern. Carbon dioxide is released through natural processes, such as respiration and volcano eruptions, as well as through human activities including deforestation, land use changes, and burning fossil fuels. Humans have increased atmospheric CO2 concentration by more than a third since the beginning of the Industrial Revolution. The burning of fossil fuels is the primary source of CO2 in our atmosphere. Methane: Produced both through natural sources and human activities, including the decomposition of wastes in landfills, agriculture, fossil fuel combustion, and manure management associated with domestic livestock. While there is not much methane in our atmosphere in comparison to CO2, methane is roughly 28 to 86 times more potent, depending on the timeframe used. Since the Industrial Revolution, human activity has produced a 40% increase in the atmospheric concentration of carbon dioxide. Carbon dioxide emissions come from combustion of fossil fuels, principally coal, oil, and natural gas, along with deforestation, soil erosion, and animal agriculture. Our oceans absorb about half of the carbon dioxide from the atmosphere. The more carbon dioxide they absorb the more acidic they become. Acidic oceans cause major ecosystem disruptions and our fisheries are greatly affected. There are 2 types of ice: sea ice (frozen ocean water) and land ice (glacial ice, including glaciers, as well as ice caps and the ice sheets). While sea ice loss does not affect global sea levels, it does affect global warming. As sea ice melts, there is less albedo, which is a measure of the amount of light that is reflected back into the atmosphere. With less white ice, more heat is absorbed by the oceans, thus contributing to temperature increase and the melting of more land ice. 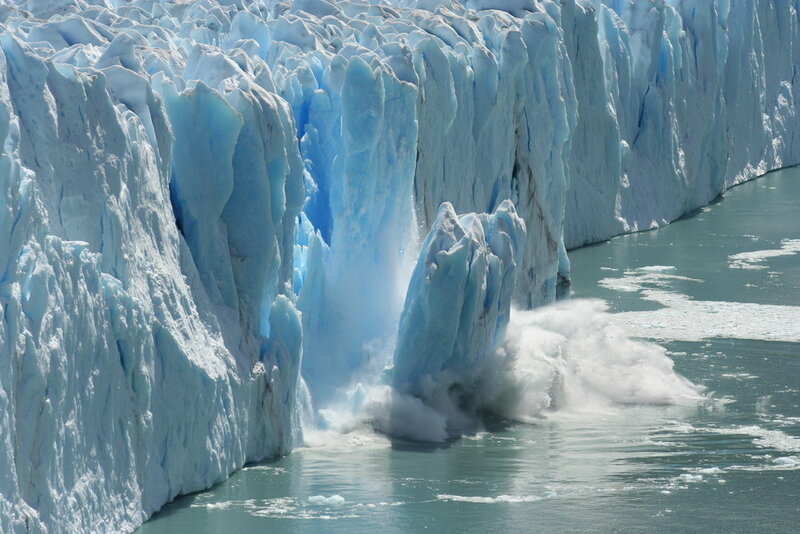 As land ice mass decreases, the melted water flows into the ocean, raising global sea levels. Global temperatures will continue to rise, making heat intolerable in some regions. Less snow cover, will result in less reflective surface from which heat is radiated back into the atmosphere. Oceans will become warmer and continue to acidify, endangering various marine ecosystems on which we depend for food. Our sea ice, ice sheets and glaciers will melt into our oceans at increasing speed. Sea-level will continue to rise, dramatically impacting our coastal cities. Extreme weather events, such as catastrophic storms and wildfires will intensify.